A customer favorite and top-seller since their introduction in 2002, Oba Oba is easily one of the best bundled stogies there is. Our value-priced Nicaraguan puros are loaded with savory flavor and feature a consistent, even burn and draw thanks to their precise Cuban-Sandwich-style construction. 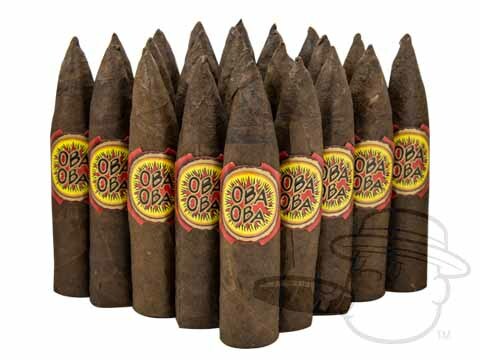 Offered in either creamy Connecticut or chocolaty maduro wrapper shades, the unbeatable value of Oba Oba is only available here, at BCP. Based on the extraordinarily low price of these cigars, I did not expect to be impressed. However, I was pleasantly surprised. The burn is usually slightly uneven for the first inch but evens out quickly; the taste is full and fairly complex. Just a few days in the humidor, and new flavors are already presenting. These were my first foray into bargain cigars, and the hunt for my everyday smoker ends here; highly recommended. Excellent "Bang for the Buck"
Surprisingly good for a relatively small, inexpensive cigar. Very good construction, burn and draw. Lots of creamy cocoa taste with some spice. Lasts longer than you would expect, given its length. One of the best cigars I've found at this price! I really wasn't expecting much for the price but was surprised what "bang for the buck" these shorts provided. They consistently provided a good even draw and lasted much longer than expected for their size. I will be ordering more. My ratings are made in the context of their relatively cheap price. I'm a fan of all the Oba Oba cigars, but was reluctant to try the 4 inch size, thinking it was too small and would smoke down too quickly. I was wrong! I just now finished my third one this week, and each one has lasted over an hour. Because the length is minimal, I don't have to make as big of a cut to get a good draw. I cut the tip to maybe 3/16 to 1/4 of an inch and the draw is perfect. Thanks BCP for a new "favorite!" Oba Oba Torpedo 4 Maduro - By Perdomo is rated 4.1 out of 5 based on 8 customer ratings.